It has almost become trite to say an album from Iceland is a melodic wandering through the country’s glacial, subarctic landscape…but c’mon. Ten seconds into Samaris’s sophomore LP, Silkidrangar, (‘silk cliffs’) and its listener is metaphysically transported directly onto the boundless, technicolor hills of Landmannalaugar. It’s that apt of a description. Whatever cliché resulted from the stereotypically chilly and atmospheric music of Iceland’s most popular exports (Sigur Rós frequently gets this descriptor. So does Ólafur Arnalds and Björk), exists for a reason. There are exceptions (like the electro-party that is FM Belfast, and maybe the incongruous reggae of Ojba Rasta), but generally, Iceland’s independent music tends to reflect the isolated country’s extreme and expansive landscape, and the alien minimalism of its largely-uninhabited space. 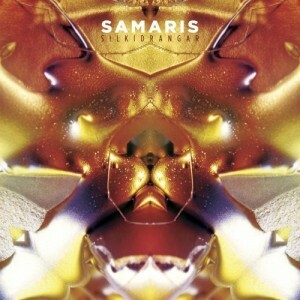 Trip-hop three-piece, Samaris is no exception, and they have approached the stereotype with an experimental twist (as Iceland’s musical mainstays often do) on last year’s self-titled debut and now with Silkidrangar. The uncanny combination of downp-tempo electronic beats, woozy clarinet, and Jófriður Ákadóttir’s (one half of indie-folk sister duo Pascal Pinon) eerily Björkian vocals is haunting, yet strangely catchy. Between the lyrics (gleaned from 19th century Icelandic poems) and ritualistic, whispery vocals — and melty, bleeping electronic beats — we’re not sure if this album sounds more like it comes from an ancient or futuristic era. Either way, it definitely sounds distant, vast, and echoey. Our main criticism is the electronic arrangements are noticeably more repetitive than on Samaris’s self-titled LP, which is slightly more discordant and unpredictable, though still shiny and minimal. But despite the production critique, Silkidrangar is a sparkling and melancholy album that we fully recommend — especially “Tibrá,” “Brennur Stjarna,” and “Vögguljóð” (a serene, ambient version of 2013’s “Vöggudub”).